Interested in checking out creative high tech projects? Want to play an educational video game? What about tech tools for innovative teaching and learning? Or maybe cutting edge technology to improve student performance and engagement? You'll find all of this at the Red & Black TIE Showcase... and all of it was created by UC students. At the Red & Black TIE (Technology Innovation in Education) Showcase, visitors will experience cutting-edge educational technologies, see ideas for how to integrate technology into teaching, learn more about the Instructional Design and Technology program at UC, as well as network with educational technology leaders from UC, local school districts, and local educational technology organizations. 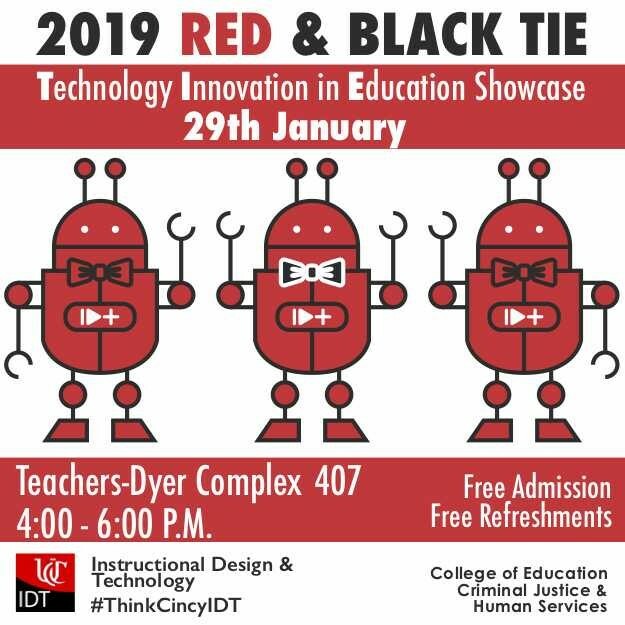 The Showcase will be held Jan. 29 from 4 to 6 p.m. in Teachers-Dyer Complex Room 407. Admission is free, and free refreshments will be available.